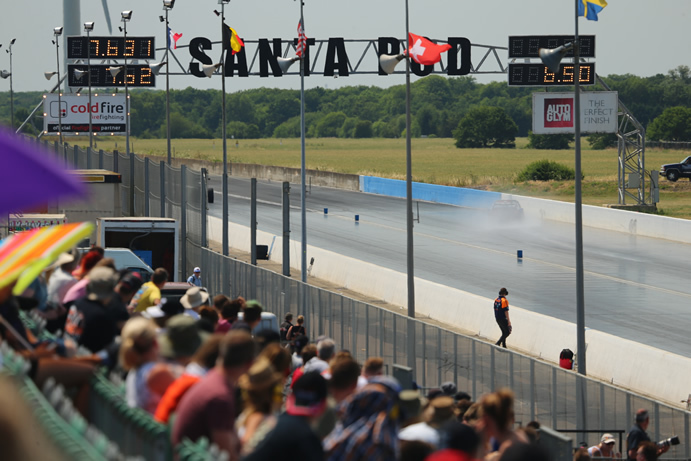 We head to Santa Pod this holiday weekend for the Festival of Power at Santa Pod Raceway.This 3 day meeting is the first round of the UK National drag racing championship. Brads engine has been rebuilt in preparation for this seasons competition, the weather forecast looks great so the whole team is looking forward to a promising Easter Weekend. Qualifying on Friday and Saturday and eliminations on Sunday. If you want to watch the action the link to the tv coverage can be found on eurodragster.com look for event coverage and then the F of P , click on the link for tv coverage. Brad and Wayne are looking forward to racing the car this year with the coveted number one on the car! 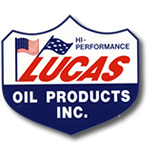 The team would like to thank our loyal sponsors, Lucas Oil UK, The Taxi Shop, Martin Williams Hull, Racewearonline.com, D&S Signs, Nick Good motorsport. We also have a returning sponsor back on board.The Plytek Group, welcome back! We will have live feed updates on Facebook and Twitter which can be viewed on the homepage of this website. 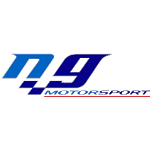 A race report will be sent to all our followers after the weekend. Wayne and Brad would like to thank all of our friends and supporters , We couldn’t do this without your fantastic support! 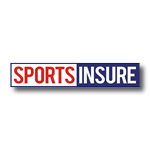 Thank you to all our sponsors and followers for your continued support throughout 2019. Brad and Wayne drove to Santa Pod when Brad had finished work on Thursday evening and arrived at Santa Pod at 11pm, the plan was to have a lie in so we could relax before the crew arrived to set up the pits. Once we set up the pits and prepared the cars we went and got Brad’s car scrutineered without any drama’s, Brad had a relaxing day and was relishing the challenge of the weekend, Brad was leading the championship but only by 160 points and mathematically anyone down to 6th place could win the championship, qualifying points would be a factor in the championship, this is our 5th year in Super Pro and Brad has been in contention every year finishing 2nd, 3rd, 5th, 2nd, and finally winning the championship this year ! Saturday brought light rain but it was enough to prevent any racing and eventually the day was abandoned, this brought a new twist to the weekend because nobody had any qualifying points so this championship looked like it could go down to the wire! Brad just had to stay in front of his rivals, Paul Przybyl, Scott Hauser, Nick Good, Joe Kellett and Laura Turboville. The rules went to emergency qualifying which is names drawn out of a hat, we drew Paul Przybyl who was 2nd in the championship, Paul was having difficulty getting his car to the track due to a gearbox failure on his truck and the qualifying ladder showed Brad to have a bye against Paul, what a cruel blow to such a nice family team. We then heard that the ladder had been revised and we now were drawn against Dave Fulton, an unknown racer to us because he usually raced in the Super Gas class, this was going to be an interesting start to the day! 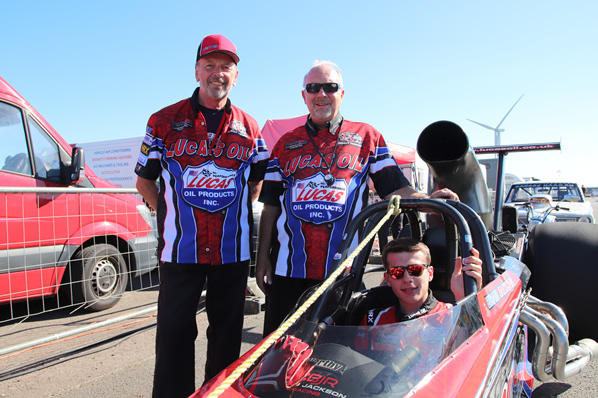 In eliminations 1 Brad pulled a 0.05 (5 hundredths of a second) reaction time and Dave pulled a very slow 0.2 ( 2 tenths of a second) reaction time, in Super pro you need a better reaction time than this to have any chance of a win and Brad took the victory. The rivals had a bad day, Scott Hauser and Nick Good both fouled with red lights, Paul didn’t make the field, Joe and Laura went through to the next round. Eliminations 2 Brad was paired against Elodie Dubois from France, Elodie is an ex junior dragster driver and was now driving a very competitive dragster, both drivers pulled almost identical reaction times and Brad had a real tough race on his hands, both drivers ran too quick and broke out (fouled) but Brad had the lesser breakout of 400 hundredths of a second to Elodie’s 12 hundredths of a second and Brad took the win. 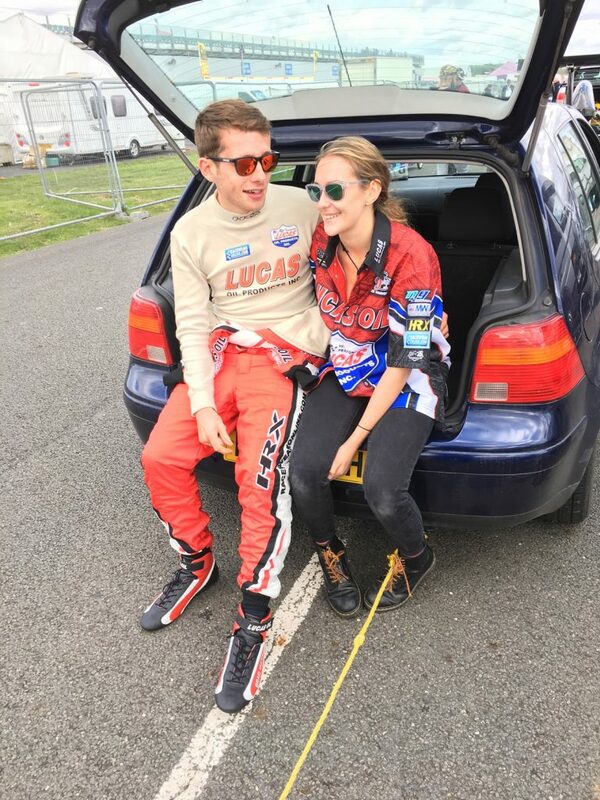 Laura lost her race to Billy Gane , both drivers were bang on their dial in, Laura ran 7.982 on a 7.98 dial in and Billy ran 8.475 on a 8.47 dial in, the closest race of the day, Billy’s better reaction time gave him the victory, this just left Joe Kellett with a chance to overhaul Brad for the championship, Joe and Brad have raced each other for the last 9 years in both Junior Dragster and Super Pro, this was now becoming a real nail biter, Brad stayed his usual cool self whilst Wayne was anything but ! Eliminations 3 Brad was 370 points in front of Joe with 400 points available, if Brad lost this race Joe could win the title by going all the way to the final and winning the event! Billy Gane had a bye, Joe was against Brian Pateman a multiple Super Pro and Super Gas champion and Brad had a really tough competitor in Dan Giles, Brad remained calm and pulled an 0.04 light to Dan’s 0.06 light so Brad had a slight advantage, Brad was 0.0685 over his index and Dan was 0.0689 over his index giving Brad the narrowest win and the championship! Joe red lit (fouled) in his race. Elimination 4 Brad was against Billy Gane, Brad made an extremely rare error and red lit by 2 hundredths of a second so was out, Wayne thinks the adrenaline from winning the championship was a factor in Brad’s red light. 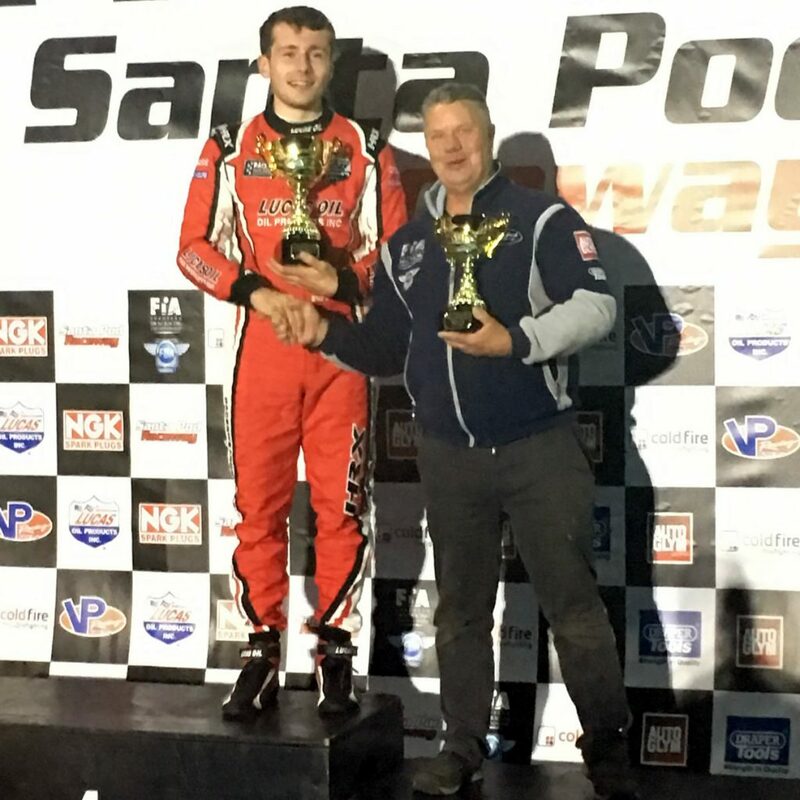 Billy Gane faced Brian Pateman in the final and Billy took the win, the points giving Billy 4th place in the European series. 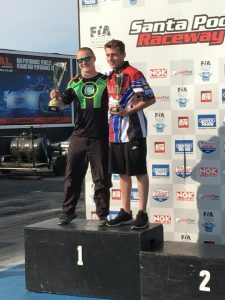 So Brad finally did it, Brad has had many successes in his career but winning the UK national championship in what is regarded as the most competive class in Europe is the pinnacle of his career to date, with this championship Brad is also the Santa Pod Racers Club Super Pro Championship winner, Brad has had a really strong finish to the year being runner up at the Summer nationals, winning the European Finals meeting and getting to the Semi Finals at the National finals meeting! What a year! 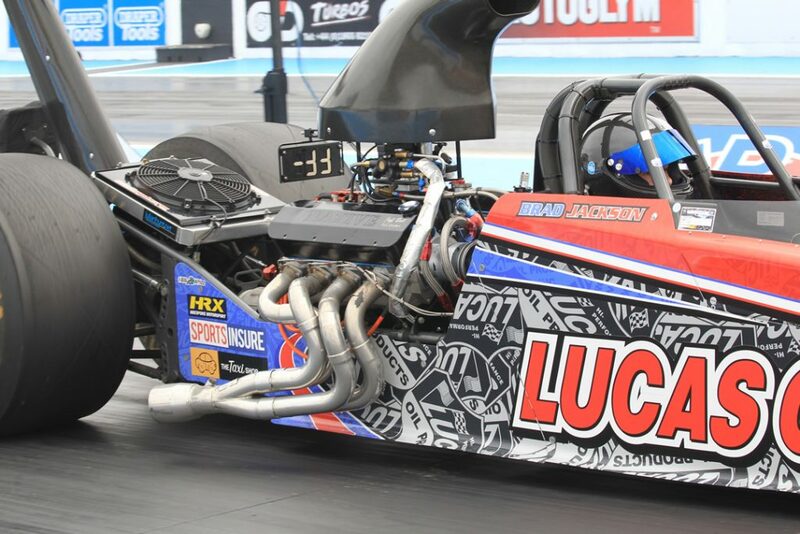 The journey with Brad started 9 years ago, 4 years in Junior Dragster and this is our 5th year in Super Pro, we have many people to thank who have help us along the way, Lucas Oil USA, Lucas Oil UK, Tom Bognor, Les Downey, Geof Hauser, Peter Scriven, Nick Good, Cristiann Carlo, Trevor Reeve, Dawn Torr, Keith West, Simon & Scott Bailey, Nick Williams and Rob Breuilly, without your help and support we couldn’t have achieved what Brad has achieved, and finally to my gorgeous wife Alison who has supported me and Brad through both of our racing careers! Many thanks to you all ! Brad is dedicating his win to our very close friend Roger Jewitt who is in St Leonards Hospice in York; Roger was extremely pleased with Brad’s win and the dedication to him gesture. Wayne and Brad would like to thank all of our friends and supporters; we couldn’t do this without your fantastic support! 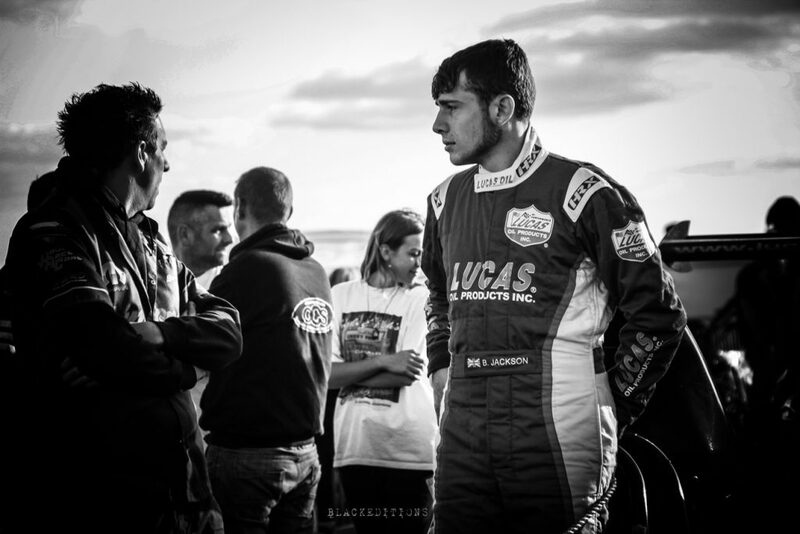 Brad Jackson Racing head to Santa Pod for the final meeting of the year, it will be a very interesting final meeting with 3 drivers realistically fighting to be the champion. Brad is leading the championship by 160 points, this means that Brad will have to qualify well and go 2 rounds further than Paul Przybyl to secure the title. Paul will have to qualify above Brad and win the event to take the title. Scott Hauser is a further 80 points behind Paul so Scott will have to go 3 rounds further than Brad or Paul and qualify better than either of them to take the title. 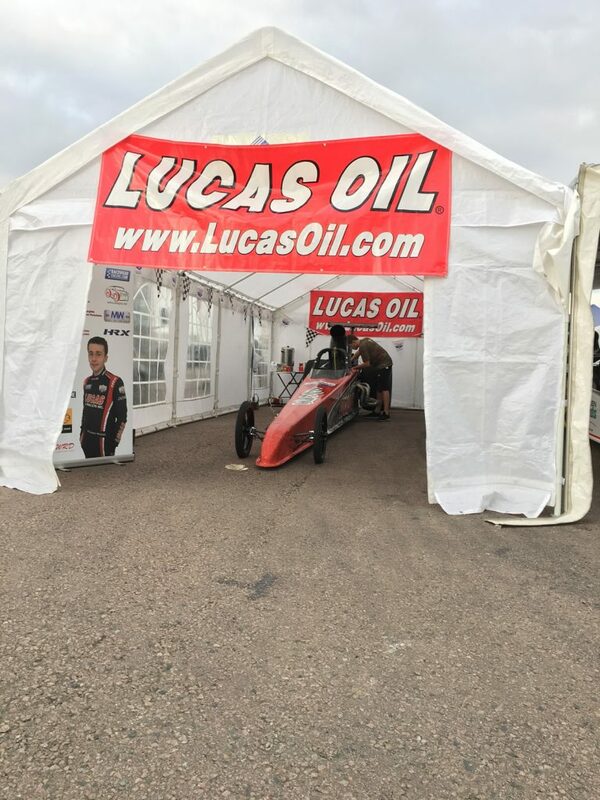 On Tuesday evening we headed for Santa Pod so we could have an early start on Wednesday morning to set up our pits because we had a 3 car Nick Good Motorsport team at the event. Wednesday we set up the pits and built the car up and took it for scrutineering, which it passed as usual, Nick and Cristiann always prepare Brad’s car to the highest standard. First qualifying run Brad pulled a 0.07 reaction time and we were 7 hundredths of a second off our dial and this left us in 8th place which was a good solid start to the day. Q2 Brad pulled a 0.04 reaction time but Brad struggled for grip and ran a slightly better time but others had improved and this left Brad in 14th place. Q3 Brad pulled a 0.08 reaction time but once again struggled for grip, got too much wheel spin and we dropped to 18th place, which was the end of the first day’s qualifying. Thursday morning we went out for Q4, Brad pulled a 0.06 reaction but once again no grip, we decided to change the set up on the car and looked forward to Q5 because we had now dropped to 21st. 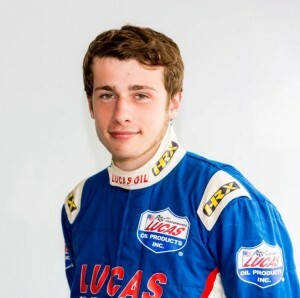 Q5 Brad pulled a 0.07 reaction and this time the car worked fine and Brad’s improvement with 2 hundredths of a second over dial improved him to 17th, in fact the first 11 places now were inside 9 thousandths of a second ! Q6 Brad pulled a 0.05 reaction and a 1 hundredths of a second over dial got Brad up to 14th place from 29 drivers, a great recovery from the grip issues we had been having, Brad had been very consistent over the 2 days with his reaction times and we now had a car we felt confident with again and looked forward to eliminations. Sunday’s round 2 of eliminations Brad was paired against Billy Gane, Billy had been really on it all weekend and was only a couple of thousandths of his dial all weekend, Brad pulled an amazing 0.005 (5 thousandths ) of a second against Billy’s creditable 7 hundredths of a second dial this gave Brad the hole shot win. 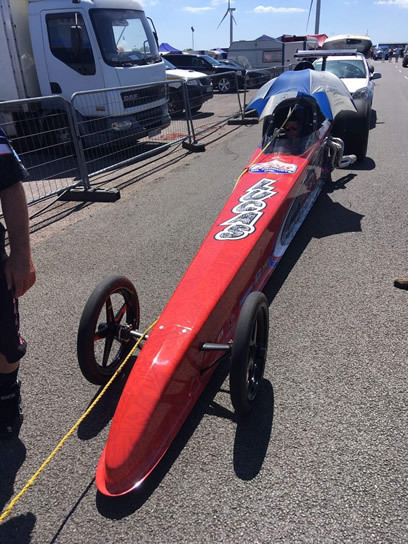 Round 3 Brad was paired against John Pryzbyl, another ex Junior Dragster driver and championship rival to Brad, John’s 0.112 reaction was no match to Brad’s 0.018 reaction and once again Brad’s great reaction time gave him the advantage and Brad took the win and was now in the semi final. 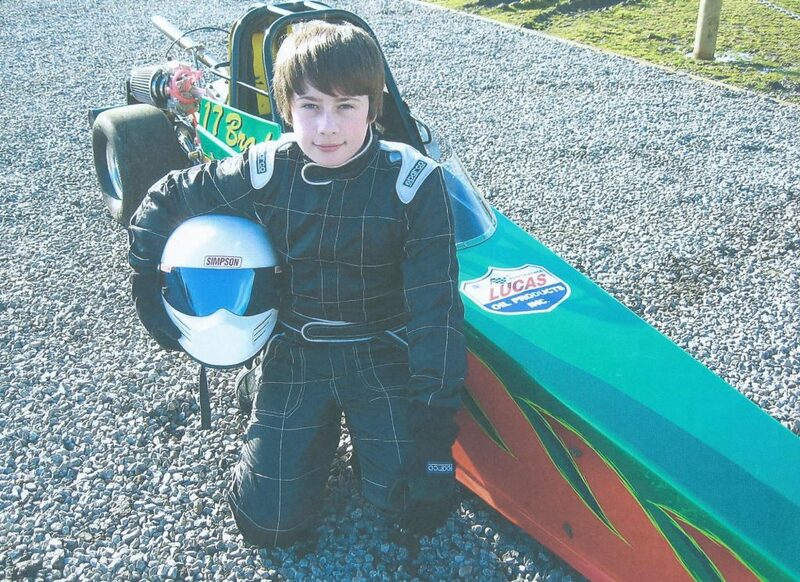 In the semi final Brad faced the seasoned campaigner Tom Atkinson who was having a good weekend, Tom pulled a 0.118 reaction time and Brad who was on fire this weekend with his super consistent reaction times pulled a 0.028 and took the hole shot win. In the final Brad faced Mark Bailey, Mark has just moved into the class stepping up from Pro ET and was having a great weekend, Mark got a little bit too hungry and red lit, so fouled giving the victory to Brad. Brad has now won the European Finals twice in the last 3 years, he is also having a great end to the season, at the last meeting he was runner up ( Summer National) and winning this meeting shows that he is at the very top of his form, with only 1 more round to go Brad is now leading the championship. Brad’s girlfriend, Liz, was with Brad all weekend and helped I think this helped him not to get too nervous about everything going on around him, as usual Brad was super cool with everything, the most laidback guy in our family ! The points at the top are extremely close and the National Finals meeting in October will be a real nail biter with any one of the top six in with a real chance of winning the championship! We are eagerly awaiting the National Finals! Eliminations start on Saturday . 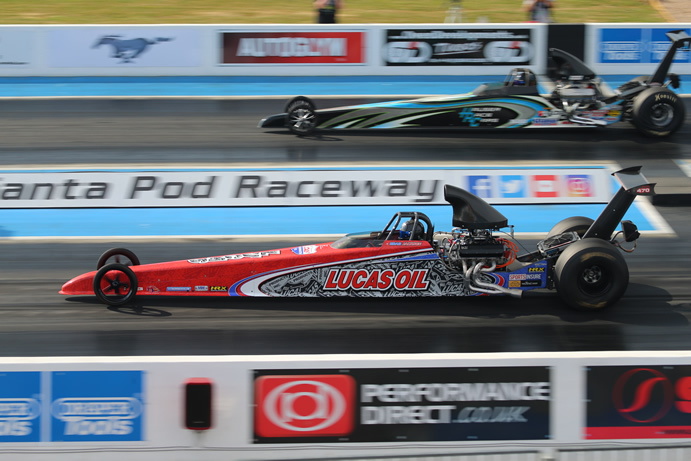 We arrived at Santa Pod with a high expectations of a brilliant weekend, the weather was absolutely fantastic and no rain whatsoever in the forecast. This was just a weekend meeting so we had only 3 scheduled qualifying runs on Saturday and the straight into eliminations on Sunday. Wayne looked at the data and his weather station and though the car should run 7.76 but the new track looked in great shape and with the heat from the glorious sunshine we dialled a 7.72, we have been having trouble getting the car dialled into the new track and the car was pulling left in both lanes, Brad left with a good start reaction time of 0.06 but the car ran arrow straight and a very quick 7.66 at 174mph ! so we broke out. 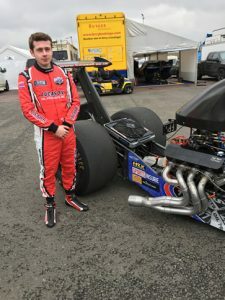 This left Brad in 20th place, not where we wanted to be, after much deliberation the crew decided the car should have a dial in of 7.62, all the calculations were correct and Brad ran 7.622, 2 thousandths of a second over dial in and put him in the number one spot with 1 session to go, taking this place away from team mate Nick Good, which Nick dropped to 2nd. This looked promising especially when Brad’s arch rival Scott Hauser in an uncharacteristic 21st place, the advantage of being number 1 qualifier was a bye run in the first round of eliminations, Scott was the last car to go in the final qualifying session and dialled 7.56 and ran 7.5602, two 10 thousandths of a second over dialling and took the number 1 spot from Brad ! Sunday brought another glorious day and we had to use the umbrella for the sun which makes a great change from using it for the rain! Round 1 of eliminations we faced the extremely talented Brian Pateman, Super Comp champion 3 times and 13 event wins to his credit, unfortunately Brian went a little too early and red lit by 1 hundredth of a second gifting the win to Brad, Brad had a 0.04 light and 4 hundredths off the dial proved that Brad was really on top of his game. Round 2 we faced Rene Jaspert from Germany, a car and driver having their first visit to Santa Pod, Brad pulled a 0.04 light but Rene went slightly better with a 0.03 light but by the time they reached the quarter mile Brad had overcome Rene with a time of 7.63 on a 7.62 dial, unfortunately Rene had a technical issue at the stripe and the car turned hard right into the wall at around 150mph suffering heavy damage to the car but all the safety equipment worked and Rene didn’t have any problems apart from a heavily damaged car, Brad had already overtaken Rene and wasn’t aware of the drama behind him. 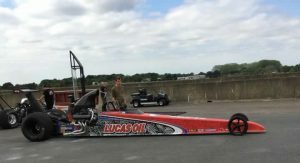 In round 3 Brad faced his old rival from Junior Dragster days, Joe Kellet, Brad pulled an 0.02 reaction time to Joe’s ) 0.07 and took the win, this was a really good round to win because Brad now had a bye run in the semi finals. In the semi final Brad still had to do a full pass to try and get lane choice, Brad had a reaction time of 0.01 and ran 7.63 on a 7.61 dial and this gave him lane choice in the final, the other semi was between Scott Hauser and John Pryzbal, also both ex Junior Dragster drivers too, Scott won the semi, John red lit and gifted the win to Scott. In the final Brad pulled a 0.001 reaction time and this gave him the advantage over Scott’s 0.07 reaction, Brad had the race in the bag when unfortunately he misjudged the race at the stripe , the car ran a personal best of 7.604 and personal fastest MPH of 176 mph, Brad broke out and this gave the win to Scott, Scott was the perfect gentleman as always and pulled Brad onto the number 1 step on the podium to share the celebration. 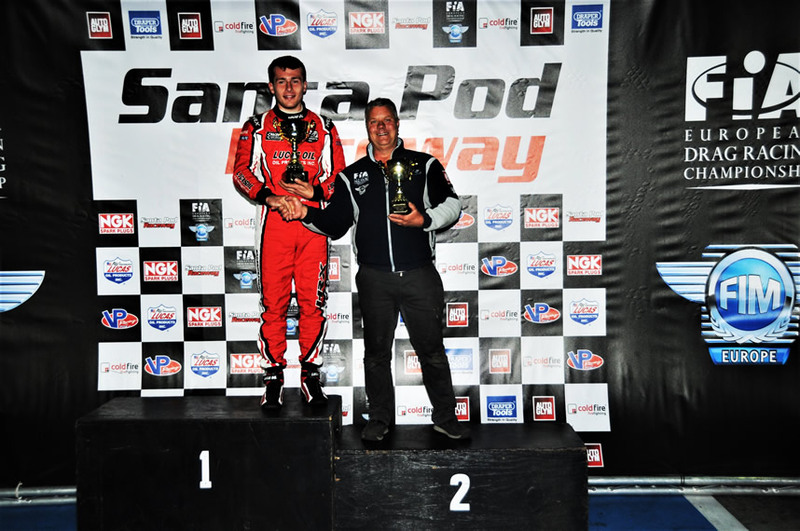 We had a fantastic weekend, runner up spot gave Brad lots of points and this puts us back near the top of the leader board and gives Brad a great shot at the title, we eagerly await the European Finals at the beginning of September, we will now have a rest over the summer break. 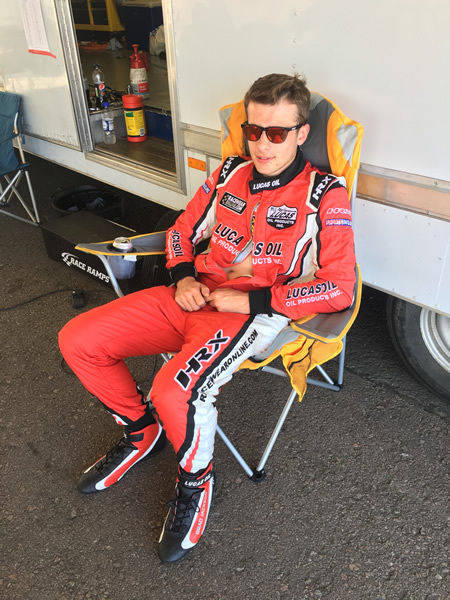 We would like to thank Nick and Cristiann for preparing Brad a great car, Dave Catton for his help as part of the crew for the weekend and a big thank you to all our sponsors for supporting Brad, we wouldn’t be racing without all of your help !!!!!!! 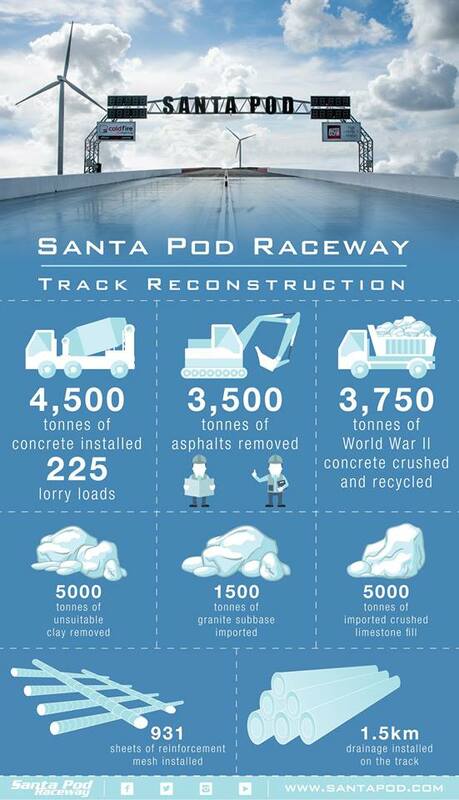 We head to Santa Pod in the morning to get set up for a great weekend in prospect at Santa Pod with an entry of the very best drivers in Europe, it is also our first run on the new £1 million pound track, the downside will be we cannot use our last 4 years of data so we are starting from scratch ! At least it will be the same for everyone and will make for an interesting, stressful and exciting weekend. Brad’s class has 45 drivers qualifying to get into a 32 car field, at last year’s event 32nd place was 900 hundredths of a second , Brad was 25th on 500 hundredths of a second, 15th pace was 100 hundredths of a second ! 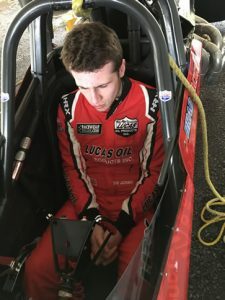 We will have a live facebook and twitter feed on the front page if you want to keep a check on Brad’s progress through the weekend.